I have seen a fair number of golf clothing companies promoting their wares on Twitter. 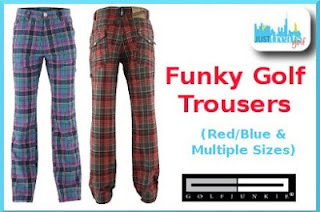 Thanks to Just Treats, I have now taken the plunge and bought a pair of trousers from Golf Junkie, that will make my wife weep. I have been quite the admirer of the - how shall I put this - 'adventurous' designs and colours of Royal and Awesome clothing. I've been trying to get my hands on a pair of their Old Tom's Trews, but without success. Besides, my wife has to draw the line somewhere and Old Tom might be it! Just Treats is offering these Golf Junkie €100 trousers for €39 - including post and packaging. The trousers are made of cotton, with some spandex in all the right places to help those of us who are - cough - more generously proportioned. Waist sizes range from 30" to 36", and all leg lengths are 32"
There are another five days on the offer - so buy yourself some strides and make your golfing partners envious of your clothing and not just your golf swing. The spandex that they inserted in the clothing is good idea. I don't know why more clothing manufacturers don't make an effort to consider the needs of all of their customers when they are building each garment. I hope your wife doesn't make you throw them out but then, who knows. If they don't look as good as she would want you to look, she will.